1968 was a transitional year for Fender amps, with tone that was still pure Fender but a look that was brand new. With a silver-and-turquoise front panel and classy aluminum "drip edge" grille cloth trim, the Twin Reverb received a fresh new face as it remained the backline amp of choice for pros and amateurs everywhere. Clear, deep and powerful, it produced big tube tone, with world-class Fender reverb and vibrato effects. 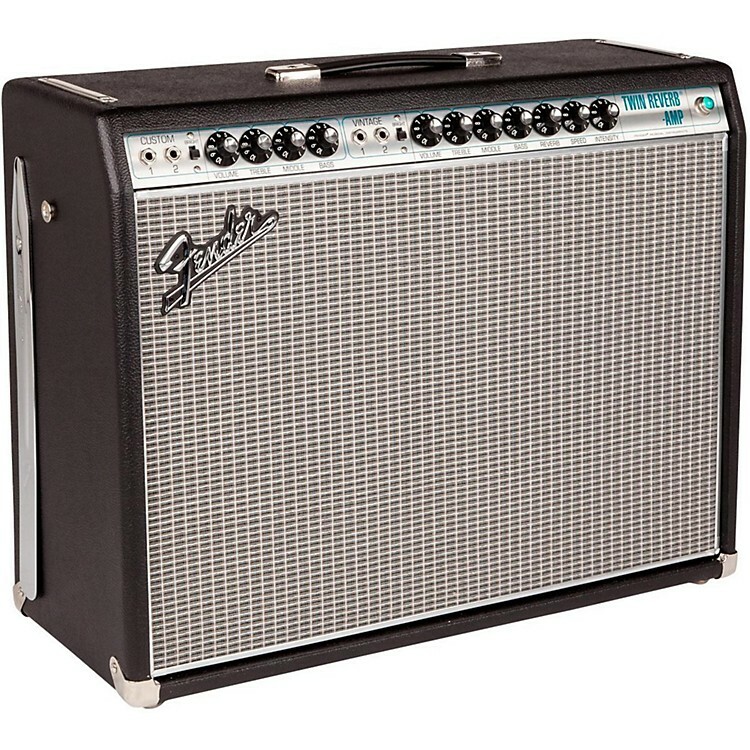 For countless guitarists ever since, the Twin Reverb has been the go-to amp for classic Fender sound. The '68 Custom Twin Reverb Amp pays tribute to the classic look, sound and performance of Fender's late-'60s "silver- face" amps. In a special twist, both channels boast reverb and tremolo, and the "custom" channel has a modified Bassman tone stack that gives modern players greater tonal flexibility with pedals. The amp also features quicker gain onset and reduced negative feedback for greater touch sensitivity. The '68 Custom Twin Reverb's dual 12" Celestion G12V-70 speakers also deliver a more distinctively rock ˜n' roll flavor. Comes equipped with Celestion Speakers (V Type) for a more modern, punchy sound that breaks up nicely when pushed. Reduced negative feedback lends a more "touch-sensitive" feel, quicker break up and added harmonic richness. The shared tremolo on both channels adds to its versatility. Because of this the '68 channels are wired in phase and can be blended for more tonal options, via A/B/Y box. "Custom" channel features a 50s Tweed "Bassman" tone circuit for more low mids and sooner breakup. The '68s are ideal for players that love their amps to break up a little sooner, rock players, alternative players that like something a little different, players that use pedals,players that love the look of "Silverface" amps. Grab this improved and powerful classic. Order today. Unique Features: Modified Twin Reverb all-tube circuitry, shared reverb and tremolo on both channels, "Vintage" channel for traditional silverface tonality, modified "Custom" channel with Bassman tone stack, reduced negative feedback for greater touch sensitivity, hand-wired tube sockets, custom-made Schumacher transformers (like the originals), genuine Fender tube-driven spring reverb, genuine Fender tube-driven tremolo ("vibrato"), 1968-style Silverface aluminum trim around silver-turquoise grille cloth.